“Good morning,” says the fox. “I am a fox,” says the fox. “I can’t play with you. I am wild,” the fox says. 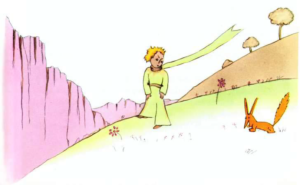 “Oh, my flower is not on Earth,” the little prince says. “Oh, nothing is perfect,” says the fox. After some time, the fox says. “My life is always the same. I hunt chickens. Men hunt me. All the chickens are similar, and all the men are similar too. So, it is a little boring. My life can be better if I am not wild for you. When I hear your steps, I can be happy. The other steps can scare me. But your steps are like music to me. And it is not all. Do you see the corn fields there? I don’t eat bread. For me corn is not important. The corn fields say nothing to me. And it is sad. The fox is quiet. The fox looks at the little prince for a long time. “Please, stay with me for some days!” the fox says. 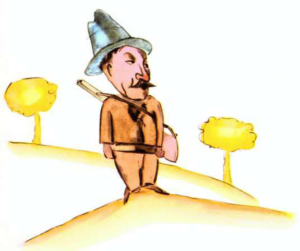 “OK, what do I have to do?” asks the little prince.